Like Stonehenge but with boats and oodles more charm. At first glance, BoatHenge seems like nothing more than a bunch of boats stuck oddly into dry land; but, like most of America’s great art installations created in a similar vein, it is only upon ruminating on the collective work itself that its true radiance begins to appear. This majestic tree has survived 400 years of storms, droughts, and floods, and is a beloved natural landmark in Missouri. The obelisk meant to mark the founding father's grave at Monticello is actually on the University of Missouri campus. 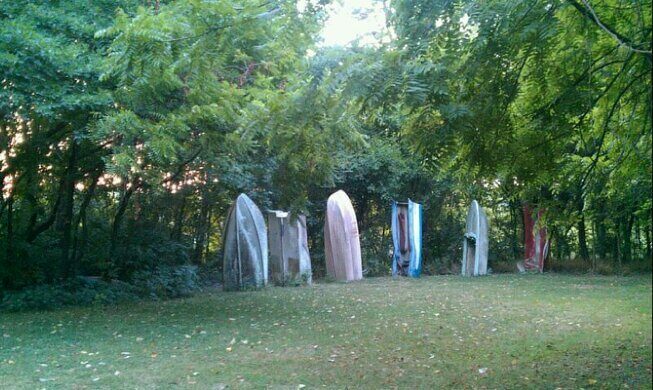 Initially seen following the hundred years’ flood of 1993, this series of painted boats in a lawn adjacent to the Katy Trail along the Missouri River is the work of anonymous artists. According to the official website, the circle of marooned crafts’ origin story states BoatHenge either “sprouted from the earth or fell from the sky on the first day of spring.” Built of the very things best suited to withstand waves, successive ravages of floods that have appeared since its arrival have done nothing to fell BoatHenge, and have instead only added to its mystical powers. Upon successfully relinquishing the obfuscated origins of BoatHenge to the realms of the unknowable, the site’s nitty-gritty details reveal that the installation consists of six fiberglass boats bursting vertically from the ground while arranged in a semi-lunar formation. Precise mathematical measurements show that their height, width, and depth planted into the earth average to (gasp!) exactly match that of the original, ancient and mysterious Stonehenge located at Wiltshire, England. Adding a more American twist to the mystery are a series of apocryphal, tongue-in-cheek ties to famed explorers Lewis and Clark. Follow directions to Coopers Landing. Boathenge is just west of there, on the other side of the bridge. You'll see it on the roadside. A spoke-tacular artwork constructed from recycled bicycle rims.